EAT UP! EAT ALOT! enjoy! mani mogo is the new Korean restaurant from Young-Mi Park Snowden. mani mogo roughly means "eat up! eat a lot! ", but also something like "hope you like it!" or "make yourself at home!" – the Korean equivalent of "guten appetit!". This fine Korean diner in Adlershof opened in June 2015. Its sister restaurants Kimchi Princess and Angry Chicken (opened 2009 and 2014 respectively) have attained global standing Kreuzberg, one of Berlin's liveliest districts, as a destination for people lovers of food, design and service. as of 7.11. on, we have a weekly changing lunch menu! mani mogo is Korean for “guten appetit”! mani mogo offers traditional Korean cuisine with dishes including bibimbap, deobap, glass noodle salad or ramyun. Park-Snowden and Volpato are committed to offering healthy, varied and freshly prepared food: guests can choose from lunch and set menus, and a vegetarian or vegan option is always available. One unique speciality Korean dish served at mani mogo is kalguksu be soup ("knife noodles"). These are handmade, cut-with-a-knife noodles, served in an aromatic broth and enriched with a range of vegetables. An extensive drinks menu offers Korean honey teas, Italian coffee specialities, homemade iced teas, tapped beer and a selection of German and Italian wines. From 7am a breakfast buffet is served, and mani mogo also offers a special catering service for companies and festivals. In the history-rich Adlershof Park-Snowden has found an aspirational young audience. The university has over 10,000 students, and 15,000 jobs have been created in recent years at this former aviation centre. A number of technology and research facilities, as well as TV stations and media companies, have settled in the area and attracted a vibrant, international clientele. mani mogo enriches the gastronomic offer in the area, and at reasonable prices: on average €5-10. In good weather, guests can sit on the terrace which offers 100 seats in addition to the 50 in the dining room. And for those who can't get away from the office, there's the advantage of a delivery service. mani mogo is open Mondays thru Fridays, 7am until 21:30pm. Born to Korean immigrant parents, Young-Mi Park-Snowden moved from Wolfsburg to Berlin in 2001. She trained as a foreign language secretary, studied German and theatre, and worked for several years in the catering industry, plus five years behind the bar at Berlin's Watergate club. 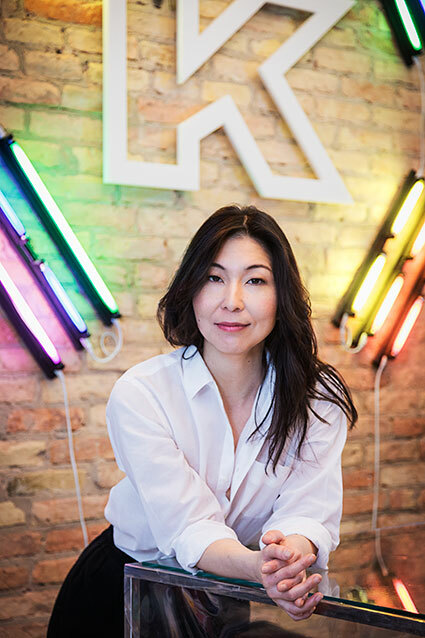 The beginning of her career as a restaurateur began at the 3 & 33 design market on Oderberger Straße where her Korean speciality stand was the most visited attraction. After running regular Korean barbecue events across Berlin, she opened Kimchi Princess in Kreuzberg in 2009.